There are some Christian writers who have a unique voice, a unique means of expressing themselves, of explaining how the Bible applies to real life. David Powlison fits this description. Through the years he has made significant, unique contributions to Christian counseling and, from there, to the ways we understand the tricky depths of the human heart. His most recent book looks to the universal struggle of anger. We all get angry and, at times, we all do anger wrong. For that reason, this is a book for each of us. 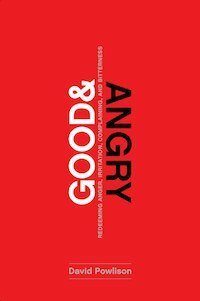 Over the years I have read a number of works on anger and often wondered why authors do not dedicate more attention to the goodness of anger, or at least to the potential goodness of anger. We have to deal with the reality that anger can be a good and right response. Some things are so terrible, so evil, that it would be downright sinful not to be angry about them. The title of Powlison’s book—Good and Angry—proves he will take a different route. Powlison explains that, at heart, anger “says ‘That’s wrong’ and acts to protect the innocent and helpless. It says, ‘That’s wrong’ and energizes us to address real problems. God, who is good and does good, expresses good anger for a good cause. Jesus gets good and angry—in the service of mercy and peace. He is willing and able to forgive us for our anger gone bad. He is willing and able to teach us to do anger right.” The problem with anger, then, is not that we get angry, but that we get angry in the wrong ways and for the wrong reasons. Powlison describes his chief goal in the book in this way: “To teach you how to more fruitfully and honestly deal with your anger.” That’s not to get rid of it altogether, but to understand it, constrain it, and direct it to the most important causes. He opens with a few chapters describing our experience of anger for, again, we all know anger. From the tiniest child to the oldest adult, anger is a universal experience. He then asks us to understand just how deep and serious our problem is, whether it manifests itself in throwing things or beating people or, more respectfully, in stone-cold silences or red-hot stares. “A gunfight is one way to cut another person off and protect your turf. Burying your head two inches deeper in a magazine is another way.” Anger is tricky that way. The book’s second section deals with the nature of anger. What is anger? Where does it come from? What do we mean to accomplish by our anger? What would anger look like if it was done right? How does God express anger? Here Powlison introduces us to anger as “the constructive displeasure of mercy.” Anger, at its best, brings good out of bad situations by standing up for the helpless and victimized. It is a response to the feeling of displeasure at seeing sorrow, injustice, or indifference. It is constructive because it intervenes to address and solve whatever problem is in view. It is mercy because it allows us to imitate God in hating suffering and expressing love to sufferers, in helping those who are suffering to find joy and peace. For this constructive displeasure of mercy to be helpful, it requires patience, forgiveness, charity, and constructive conflict, and all four of these receive a lengthy treatment. Section three deals with how to change, with how people who have been angry in the wrong ways can learn to be angry in the right ways. It culminates in eight questions that help take apart anger, to see what is really there, and to see how it can be used constructively. “Working through these eight questions will help you understand yourself. They will help you find God in the midst of your angry moment. They will also make you more helpful to other people. When you’ve really learned something well, you’ve got something good to give away to others.” This is classic Powlison who brings x-ray-like questions to bear on the human heart, calling us to probe deeper and deeper beneath the context of our anger, beneath the emotions we feel and the actions we take, to understand it at its very root. As the book draws toward a close, Powlison tackles head-on some of the hard cases: the anger based on an experience you’re sure you will never be able to get over, the everyday irritability that dogs so many of us, anger directed at self, and anger directed at God. A “Final Word” assures us all that all of this anger is going somewhere, that it has purpose and meaning, but that some day we will no longer have cause to be angry. For today anger is necessary, a necessary means of dealing with the world’s sin and injustice. But some day all evil, all sin, all injustice will be wiped away…and anger with it. As long as we live in a world of sin we live in a world where anger is a tragic necessity, a good and right response to terrible evils. Yet just as anger can be used well, it can be used poorly. Just as it can be constructive, it can be horrifically destructive. Powlison’s assurance to the reader is this: “If you take this book to heart, you’ll get anger right more often.” And, having read it, I quite agree. He shows what anger is, why it is good and necessary, how it too often gets away from us, and how we can redeem it to its God-ordained purpose.